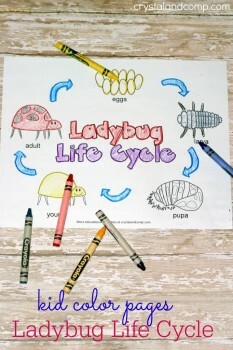 This cute ladybug lifecycle printable can be used in many ways. Start at the top of the page and work your way around talking about each stage of progression for the ladybug. Follow the arrows. Color each step of the way. You can break it down page by page. Talk about where the ladybug lays her eggs. And many more activities. This post includes ideas.